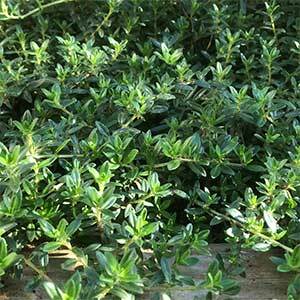 Named after Jekka McVicar, Jekka’s Thyme is a dense low growing variety with great flavour. Flowering early in the season compared to other thyme varieties, this is a thyme that can be deadheaded with garden shears and it will flower again in summer. You can grow it in the kitchen garden and harvest the new growth for culinary use. It is low growing and could be used as an edging plant for pathways where the fragrant foliage is brushed against or crushed. It is a little too tall for growing between pavers where heavy foot traffic occurs. The pale pink flowers that cover the plant attract bees to the garden, along with the great flavour, just one more benefit of this useful garden plant. Jekka’s, its well worth a read.